Homemade (yes, homemade!) ricotta, is something that takes only two ingredients and almost no heat and no effort. Thanks to my friend Kate, I now know all the silliness of my past efforts in bringing that milk to a boil was way overkill for a soft ricotta. You need only bring your milk, in this case a half gallon of beautiful and local Snowville whole milk to just a scald (about 180F), mix in the juice from a lemon, or a couple of tablespoons of vinegar, stir for a moment and marvel at how quickly the curd splits from the whey. Take it off the heat and let it cool completely in the pot, then pour into a colander lined with several layers of cheesecloth set over a deep bowl. Let it drain for as little or long as you like. And save all of that whey. It always felt wasteful to me to throw all of it out. Fortunately, you can make the most impossibly light crepes with the whey. And they are perfect for filling with raw or barely cooked zucchini, some picked thyme and the ricotta. And because you’ve made your ricotta with lemons, the crepes and the cheese impart a lovely citrus note that partners the zucchini beautifully. Over medium heat in a large pot add the milk and heat just until bubbles start to foam and form around the edges of the pot. Add the lemon juice and stir. The curds will immediately start to split from the whey. Remove from the heat and let cool in the pot. Line a colander with several layers of cheesecloth and and set it over a large bowl. Carefully pour the curds and whey into the colander. Allow to drain for about 10 minutes, longer if you’d like a drier ricotta. Blend until smooth and send the whole pitcher into the fridge to chill for an hour. Heat a small nonstick pan over medium heat and coat with butter. Pour in a couple of tablespoons of batter and swirl the pan to coat evenly. Allow the crepe to cook for two minutes or so, shake the pan to loosen the crepe or use a spatula just along the edges then flip. The best method for this is to very confidently (and holding the pan firmly) thrust the pan away from you in a hard, quick motion. Cook for another minute, then remove to a plate to keep warm. Heat a pan over medium high heat until hot. Add the butter and brown slightly, about a minute. Add the zucchini, thyme, salt and pepper, tossing in the brown butter to coat and cook, about one minute. Remove to a bowl. 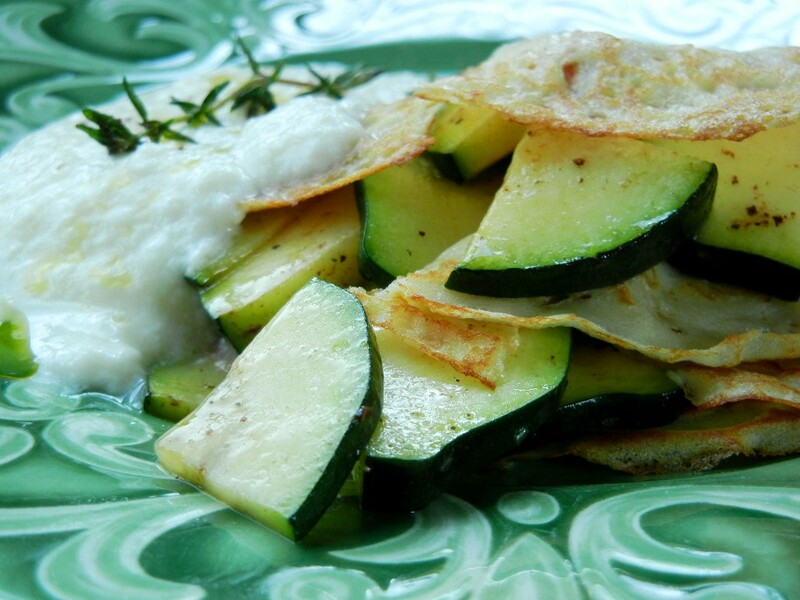 Fill crepes with zucchini and spoon ricotta on the side. 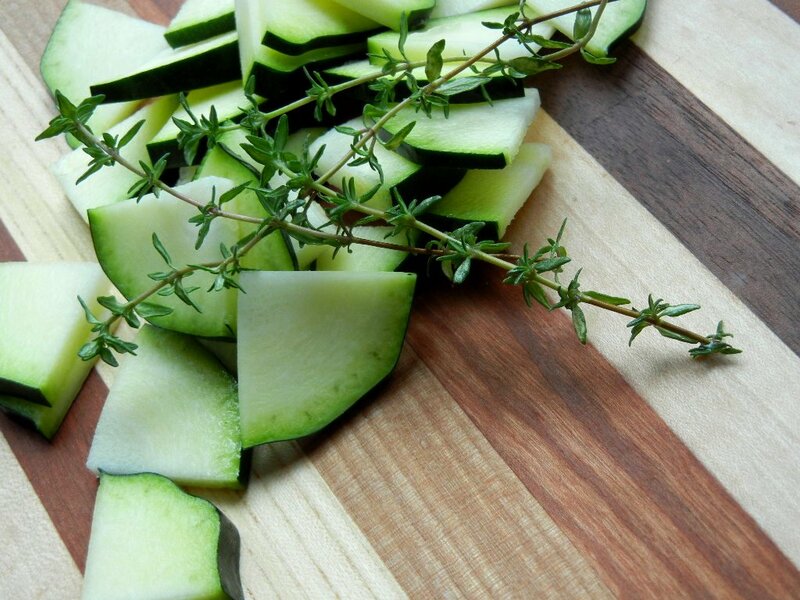 Garnish with more thyme and a twist of black pepper. Playlist included Stay with You, by Springfield, Ohio’s homegrown crooner John Legend.